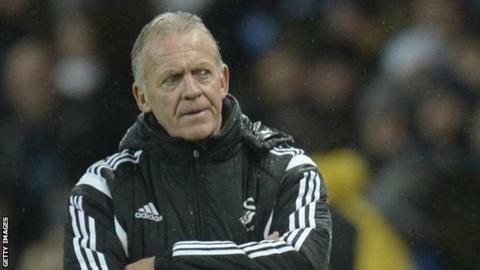 Swansea City caretaker manager Alan Curtis expects the Premier League strugglers to target a forward during the January transfer window. The Swans parted company with manager Garry Monk during a slump that has seen them win once in their past 13 Premier League games. They are in the relegation zone having finished eighth last season. "We're searching for a striker," said Curtis, who says he will not be directly involved in recruitment. "Everybody is looking for players who can improve the squad and improve the team." Swansea's leading scorer, Frenchman Bafetimbi Gomis, has five goals in 18 appearances in all competitions this season. Eder, who is injured going into the festive period, has not scored in 14 games, 10 of which he started on the bench. Mid-table Stoke City and bottom club Aston Villa are the joint-lowest scorers in the Premier League table with 14 each. Swansea are next lowest with 15 goals while West Brom (17) and struggling Newcastle United (19) - who are two points ahead of the Welsh club in 17th - are also yet to reach 20 goals for season. Curtis added: "When a striker was mentioned, there are areas that we need improving or else we wouldn't be where we are. "There will be some movement and you could probably throw a blanket and say that we need strengthening everywhere." Swansea are home to West Brom on 26 December and away to Crystal Palace two days later before a trip to Manchester United on 2 January.